The Mars Science Laboratory, a car-sized rover due to land on the Red Planet ealy next month, is the latest endeavour by humanity to establish whether or not we are alone in the Solar System. The planet Mars, in particular, has long captured the imagination in this regard. Observations of apparent similarities between Mars and Earth led 17th and 18th Century astronomers to assume that Mars may be inhabited by some kind of life forms. It was already known that the length of day on Mars was almost identical to that on Earth and that the planets axial tilts were also similar. Some speculated that darker features observed on Mars were areas of water, while lighter areas were land. Interest was piqued in the 19th Century following observation of seemingly artificial linear features on Mars. (Incidentally, the usage of the term canals for these features was mistranslated from a description by Italian astronomer Giovanni Schiaparelli, who used the word canali). Irish astronomer Charles E. Burton made some of the earliest drawings of straight-line features on Mars. Despite these lines later being shown to be an optical illusion, popular imagination was understandably stimulated. H. G. Wells, was inspired to write The War of the Worlds in 1897, depicting an alien invasion from Mars. American astronomer Percival Lowell published a book, entitled Mars and its Canals, in 1906, asserting that the canals were the remnants of an extinct civilization. Determine whether Mars could ever have supported life (by searching for biosignatures, the chemical building blocks of life). 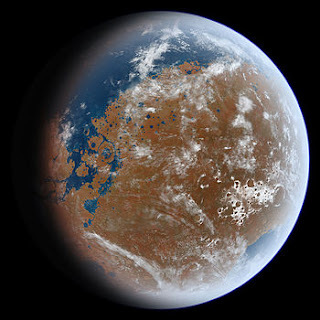 Study the climate of Mars (especially the water and carbon dioxide cycles). Study the geology of Mars (both of the present and from over the past 4 billion years). Plan for a human mission to Mars (by ascertaining radiation levels on the surface). The potential of Mars in ascertaining the rarity or otherwise of life in this solar system is clear. Already, a number of future missions are being planned, such as the ExoMars mission, a collaboration between the European Space Agency and the Russian Federal Space Agency. It is thought that any life or remnants of life will exist deep beneath the surface where it is shielded from radiation and atmospheric exposure. The current lander will be capable capable of digging some 10cm into the Martian soil. Biosignatures, should they exist, are likely to be more easily detected at deeper levels. There are tantalising clues in the atmosphere- some 270 tonnes of methane are emitted into the atmosphere each (Martian) year- are microorganisms creating this? The exciting possibility of the discovery of extraterrestrial life, extinct or otherwise, cannot be ignored. The name Curiosity was decided with the aid of an essay competition, won by Clara Ma, an eleven year-old schoolchild. The tyres on the rover are embossed with a tread pattern which will leave an impression on the Martian surface spelling JPL (Jet Propulsion Laboratory) in Morse Code (·--- ·--· ·-··). This is used to help determine the distance traveled. There are two on-board radiation hardened computers, each including 256 KB of EEPROM, 256 MB of DRAM, and 2 GB of flash memory. Approximately 50% of all lander and orbiter missions to Mars have ended in failure. This has become known as the Martian Curse.